We were notified by our Metricon Site Manager, Simon yesterday that the house was ready for Pre-Plaster inspection either today or tomorrow. I was able to get Theo from New Home Inspections (the same folks who did our Frame Inspection) in short notice to do the inspection today at 10.30am. And by 4pm today I got the report. How’s that for prompt service by the folks at New Home Inspections! Needless to say, I have now forwarded the report to Simon to followup. As part of the Pre-Plaster inspection, Theo went over the defects that were identified from the Frame Inspection to make sure they have been fixed satisfactorily according to the building standards. Whilst some items from the Frame Inspection have been fixed, there are still some defects still outstanding. Hopefully it won’t take too long for Metricon to get the remaining items from Frame Inspection fixed in addition to the new Pe-Plaster defects. We also did our own walkthrough of the electrical work ourselves yesterday evening to ensure the switches, powerpoints, data points and TV connections were at the right locations. We identified 3 items that were not correct which Simon has already raised with the electricians today. We are making good progress into the build. But what is more important for us is the quality of the work and the integrity of the build is vital and that any defects get addressed. To build a house is not cheap, so we want to make sure it gets done right. Fixing defects now will be easier (and cheaper) than fixing them later. Today Theo from New Home Inspections went on site this morning to do our independent frame inspection. We received the written report in the afternoon which we have forwarded to Simon, our Site Manager, to resolve and fix. The report’s Schedule of Building Defects outlined 14 items that needed attention. So far the interaction and the service provided by New Home Inspections has been good. The above feedback from Theo on the quality of the building work so far has been positive and despite the 14 items raised, we have been reassured that these issues will be resolved. Having the independednt inspection done has provided us with peace of mind that another set of eyes have looked over the house. Hopefully it won’t take Metricon too long to fix these defects in addition to those that may have been identified by their own building surveyors. The checking of the as-poured concrete slab for any exposed steel around its perimeter; any blow-out along its edges that will potentially block the cavity width; as well as for any bottom plate overhang which if not rectified will allow rotation of the walls bottom plates. The finish of the concrete is also checked for excessive cracking and/or dusting. Floor levelness is also checked across each storey (whenever clear and where possible). The checking of the constructed wall frames for their compliance with the Building Code, their plumbness and the correct installation of their bracing. The checking of the roof truss installation and bracing. We also systematically go through the approved engineering design to ensure that the as-built structure is compliant whenever these have been supplied to us. 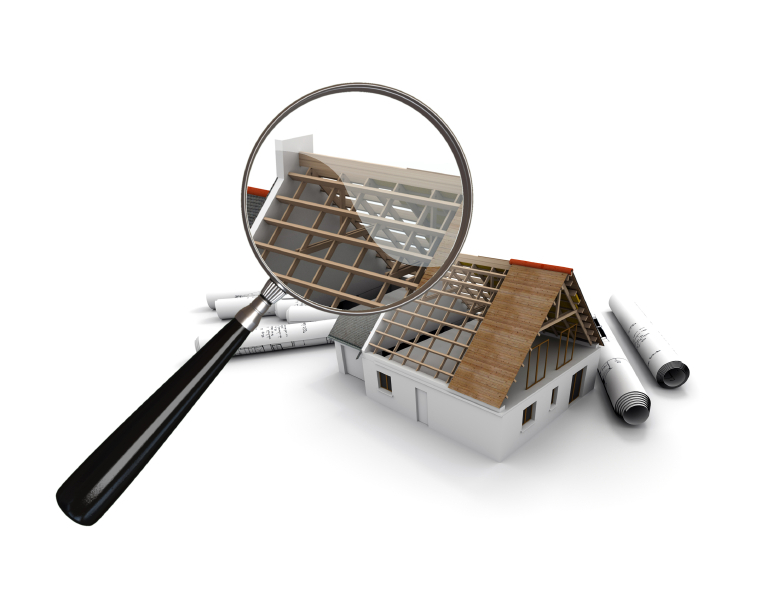 Building a new house is a big investment and such a significant transaction requires thorough inspections. This will ensure any defects (by reference to the Building Code of Australia and/or relevant Australian Standards) that exist are identified so they can be rectified early. It also gives a peace of mind that multiple (knowledgeable) eyes have looked over the house. 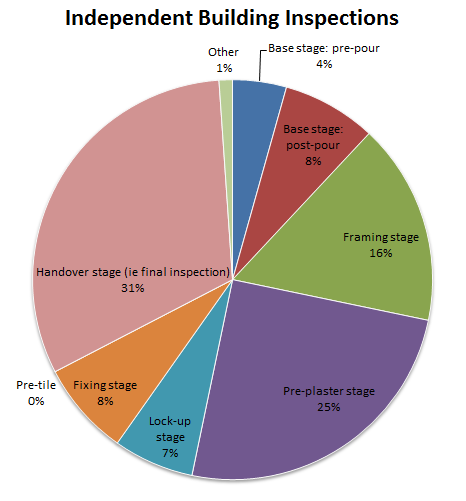 Here are the results of a survey we posted in the HomeOne Forum of the stages that people have organised their own independent inspections. Metricon use their contracted building surveyors to do their indpendent inspections. In addition to this, we have decided to also engage our own independent inspection to have another set of eyes to go over the work. We originally were planning to have 2 (pre-plaster and pre-handover) inspections, but given the cost of the inspection compared with the cost of the entire house we decided to go for the 3 most common ones. Inspection prices varies between $260 – $900 per inspection depending on size of house, whether its single or double story and stage of inspection. We are not sure if price is a reflection of the quality of the inspection. If someone has a comment on this, we would like to hear from you. We had several first hand recommendations and in the end we have engaged New Home Inspections. We will organise the frame stage inspection soon as its nearing frame completion. We’ll post our experience with the independent inspections as we go through them.